You’re in San Diego! The sun is shining, the birds helped you make your bed this morning, and your kids have enough energy to start 12 different companies before lunch. What do you do next?? We’ve compiled a list of our favorite kid-friendly places around San Diego and NO we do not include Legoland. Don’t worry about lugging chairs and umbrellas to a beach day at the Catamaran! Every morning the hotel sets up lounge chairs and umbrellas in the sand for their guests, but if you buy a drink or some food from their restaurant you can use them for the day. Parking is a little challenging, but that means you have fewer people to get lost in! The Catamaran is a bayside hotel on the northwest side of Mission Bay. If your kids aren’t great swimmers this is a great alternative to the ocean beach where the waves are more powerful. This one’s for the older kiddos. Mission Beach has two massive parking lots (one on either side of the roller coaster), a ROLLERCOASTER, mini golf, arcade games, a ton of food options to purchase and the beach! Mission Beach is one of the most crowded beaches in San Diego but if you’re looking to keep your older kids entertained this is the spot. Water fountains you can run in! San Diego’s Waterfront Park is Downtown, between Little Italy and the San Diego Harbor. Large grassy areas, interactive water fountains, multiple jungle gyms and picnic areas for the whole family! Street parking may be difficult on a sunny day so there’s a $10 parking garage underneath the park. Welcome to the lesser known Torrey Pines trail that ends at a playground! You can either pay to park at the North Beach Lot or find free street parking on Carmel Valley Road. Start walking at the North Beach Lot and walk under the bridge. You’ll walk north on the sandy beach for about 10 minutes before you come up to the dirt trail. This trail takes you above the cliffs and runs parallel to the rail road tracks for two miles. This is a great trail to see any whales or dolphins in the ocean and it’s fun to have the trains speed past, but be careful with the little ones and make sure they stay on the trail! You can spend an hour or a full day here! Pack all the kids in a car and pay to park (entrance fee is per car and has no time limit). You can learn a little San Diego history while exploring the museum next to the parking lot, then head up to the lighthouse! Walk around the lighthouse grounds and see the garden where the keepers used to grow their food. If the kiddos have a little more energy take them on the out-and-back hike down the hill. If it’s a hot day bring plenty of water because there is no shade. On your way back up take a rest at the Artist’s House and if you’re there during the summertime the Artist in Residence offers free art lessons one Saturday every month. Click here for more details. And don’t forget to explore the tide pools on the other side! IT’S AN AQUARIUM! Come on. Kids of any age love sea creatures and this place has plenty! The rooms are cooler so this is a perfect outing for a hot summer day. Check out their calendar and see them feed the sharks and turtles! This is a loaded tip. Get ready :) If you’re going to Balboa Park, you may as well make a full day out of it. Park where you can and start exploring! Our favorite things to do as kids were play with electricity at the Fleet Science Center, smell the chocolate plants and see the venus fly traps in the Botanical Garden, share a baked item from one of the cafe carts, play in the huge water fountain, eat lunch in the rose garden and wander through the Japanese Friendship Gardens. 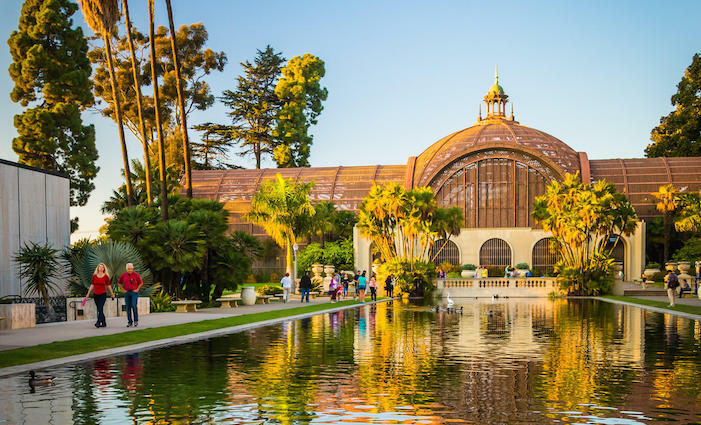 You can make Balboa Park as cheap or expensive as you want so plan accordingly and your kids will have plenty to do! Take your kids on an island adventure! This park is on Coronado Island and the adventure starts on the ride over. You can either take a ferry ride across the harbor or drive yourself across the huge bridge that gives an incredible view of all of San Diego. Centenniel Park has plenty of grass to run on, shops to buy food and is dog friendly! Welcome to Paradise! If you want to stay at a resort for a day without paying the full price opt for a day pass! Paradise Point is situated in the middle of Mission Bay perfectly secluded from crowds. $10 per child and $25 per adult gives you access to a huge pool with a large shallow end for the littles and plenty of loungers and umbrellas, a jacuzzi, 10% discount at the hotel restaurants, coy pond, access to the fitness center and free parking! Click here for more info. You care about the environment, value quality, and want a small business owner to do a happy dance. We put together a list of our favorite San Diego born products so you don't have to stress about your morals while picking out gifts this holiday season. These are the comfiest pair of pants we've ever owned AND they make us look like we know how to "fashion." 100% rayon, lightweight, wide stretchy waistband, scrunched bottoms to turn into capris, and 10% of net profits go to sea turtle conservation. These are the perfect travel pants, loungewear, or post surf pants because they fit loose around the legs and offer sun protection. Pant vibes? Picture Princess Jasmine who can save her damn self. Vira Sun was founded in San Diego, inspired by the active yogis in our beach town. Polarized lenses, wooden or bamboo arms, and so many colors to choose from. These sunglasses are lightweight so they leave no marks on our faces, are structurally built to stay on during activities, and again, make us look fashionable af. Beautiful, handmade, one of a kind meditation cushions, and hand-crafted fragrance soy candles. Kristi and Steph are both certified yoga teachers and bring that powerful energy to their products. The candles even have secret positive messages as the wax melts down! Oh, and the candles last 65 hours! Sale happening on their site NOW! No code necessary for cushions. Skin care products with soul! We try to avoid foods with ingredients we can't pronounce, but what about your skincare? What's in your favorite face wash or lotion? This 100% organic, plant based skincare is made by a local surfer, fur mama, and human extraordinaire. Each piece is handmade using natural organic oils, botanicals, minerals, clays and herbs. Trust us, you deserve this. Do you really need this explained? Handmade organic 2-ingredient single-source dark chocolate perfectly crafted in San Diego. Organic. Sustainable. Family Owned & Run. Come on. Ridiculously soft tees, tanks and long sleeves with designs made out of tiny positive words NOT found on Hallmark cards. Every design encourages people to know what’s possible for themselves, and be aware of the power of their own thoughts. They believe attitude is everything and want to share it with the world. Enter Code: positive20 for 20% off! Sunscreen that is REEF SAFE! People, we don't have any more excuses to NOT use reef safe sunscreens. Every stick is handmade with natural vegan ingredients right in Ocean Beach, San Diego. The available tints don't require rubbing in or waiting for chemicals to absorb into your skin before sun exposure. Don't even think about drying out your face - Solistick keeps you moisturized with ingredients such as argan oil, cocoa butter, vitamin e, and olive wax. The most delicious and nutritious combination of chocolate, coconut and almond goodness this earth has ever tasted. Enter "winning" for 15% off your entire order. Ios was the vacation we had been waiting the whole trip for. Italy was walking around 8 miles a day trying to see as much as possible, Athens was visiting as many ruins as we could remember from Greek mythology, but Ios was where we stopped to breathe. Ios is a small island in the Aegean Sea with about 2,000 people living on its hills year around. During the high season (July-September) the small island is flooded with tourists from all over the world. We arrived at the start of this peak season so it wasn't too crowded yet. We stayed in a hotel called Villa Mata which we found on Airbnb. The hotel owner who quickly became one of our favorite humans on the island was waiting for us at the port with a big sign and a huge smile at 11pm when our ferry arrived. He showed us the short walk from the port to his hotel and we couldn't believe how beautiful Villa Mata was! Grape vines and fig trees surrounded the Greek styled building and there was a cute area to sit with tables and chairs downstairs. Our room was upstairs and much bigger than we expected with our own bathroom, balcony with a table and chairs and a sink with kitchen utensils, air conditioning, mini fridge, and plenty of shelves to store our things. If anyone is looking for a place to stay on the island we cannot recommend Villa Mata enough as it's a 1 minute walk to the beach, 4 minute walk to the bus stop, port and cute local restaurants, and a 10 minute walk to Chora Village which is where most of the island lives. The relaxing vibes and location of Villa Mata set the pace for our week, allowing us to spend our days and nights exactly how we wanted whether we were looking to dance all night with Australians or relax on a quiet beach with fresh veggie gyros. We would do a terrible job trying to describe the beauty of these beaches so take a gander at these sweet pics. Our stay in Athens was the first time we felt "home" on this trip. The kind smiles, the sassy locals, and the fresh vegetables drizzled with olive oil and lemon juice... the flow of this bustling town was second nature to us (even though we didn't have gelato every day). We stayed in an Airbnb outside the city center with an incredibly helpful host who sent us maps and timetables for every type of public transport, AND sent us the wifi password BEFORE we arrived. We woke up our first morning around 10:30am (surprise), saved our address in Google Maps, and headed out to the Metro station. Breakfast isn't very popular here so the Rickaroons we packed were a huge lifesaver to start our busy days energized. We got off a stop ahead of the Plaka to explore the markets and pick up some snacks for our day. Cherries are at the peak of their season over here so we packed a large bag of those, some fresh bread, tomatoes, olives, nectarines, figs, and filled up our water bottles. We bought a small knife for 1 euro to cut up the tomato then headed toward the Plaka. The Plaka is the oldest section of Athens and was described to us as the mainland Greek island. Narrow streets are colorfully decorated with hanging grape vines and flowers, small restaurants spilling onto the sidewalk, and jewelry and clothing shops. We wandered through the maze and started walking up the hill towards the Acropolis. Tourists on their way back down kept pointing us in the right direction (we don't know if they were just so excited to speak English with someone or what, but every single person happily helped us along) until we took a final turn in the road and saw the citadel sitting on the mountaintop. It literally stopped us in our tracks. The Acropolis sits on a rocky outcrop of the mountain and contains several amazing structures including the Parthenon. Standing over the city with the wind rushing past you and sunshine energizing your muscles gives you a sense of what it felt like thousands of years ago- the power this place held. We slowly made our way around all the ruins and headed towards the big Greek flag flying above it all. That was when it really hit us that we made it to Greece. The flag cast a small shadow on the rocks so we posted up underneath for Christina to sketch the Parthenon and me to watch everyone try and get the perfect selfie angle with their screaming kids (best form of birth control in 2 seconds). We walked down the huge stone steps and weaved through the olive tree garden towards the only water fountain on the mountain. Refilled and finally hydrated, we spent the ridiculous amount of euros for two frozen lemonades because frozen lemonade is life. The road led us back into the flea market where we bought new sandals (our old ones literally were split in half at this point) and sat down for an 8:30pm dinner with the bright blue sky above us. Our big Athens adventure day ended with full bellies, dusty feet in sweet looking shoes, and a new love for this once powerful empire that epitomized the best of Greek virtues. The small city on a hill north of Rome by an hour. You take the train in from Rome and ride the funicular up the mountain, then everything is walkable! The main road takes you through the whole city and has all the popular food stops, eventually leading you to Il Duomo, the town's big cathedral. The front of the cathedral is a mosaic facade of biblical stories made by different generations, and the sides are black and white stripes. The city wakes up around 7am with the shops owners coming up from the town below. Most places close for reposo, afternoon naps, between 1pm-4pm, and families go out at night for late dinners. There were multiple times a child in a stroller was out past our bedtime. Check out photos from our stay below! As we grow Rickaroons there is a question that people ask us frequently at farmers markets: "Are these healthy OR do they taste good?" Answer: "Both". And since the answer is both, we have picked up two new awesome accounts this week - a fitness studio and a yoga studio. Prana Yoga studio, a favorite of two of the Rickaroons founders, has started selling the Megaroon and Bird Rock Fit has started selling all four flavors. The idea to sell at yoga and fitness studios came from the experience of the founders. It seems like time hunger always strikes an hour before workout time. Rickaroons seem to be enough to quell the hunger pangs through the workout without being heavy. Just like they were intended by Rick, Rickaroons are becoming known as a fuel for fitness.